In 2003, Kansas and the Republic of Armenia were linked under the National Guard Bureau's State Partnership Program. The Kansas National Guard works closely with the Armenian Ministry of Defense, Ministry of Health, Rescue Service and other governmental offices and agencies. Types of cooperation include military-to-military, military-to-civilian, and civilian-to-civilian events. 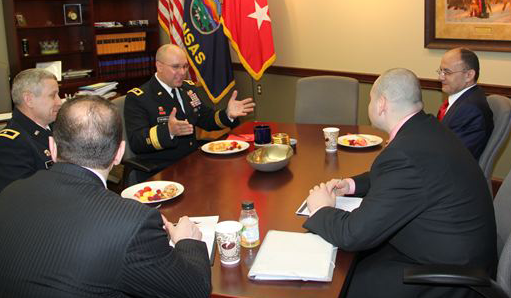 Twice a year, in January and July, the State Partnership Program hosts the International Officers visit from Command and General Staff College, Fort Leavenworth, Kan. This is a state government visit to Topeka to familiarize international officers with the judicial, legislative and executive branches of state government; including the role of the National Guard. Military cooperation events continue to focus on enhancing U.S. military standards and procedures, as well as enhancing interoperability between Euro-Atlantic and Armenian forces. Annually, the State Partnership Program continues efforts to expand beyond the military-to-military relationships. Civil engagement initiatives began in 2008 in the areas of higher education and law enforcement and have begun to show tangible results. Military exchange events in the past have included members of both the Kansas Army and Air National Guard. In 2015, members of the Kansas National Guard mentored soldiers of the Armenian Peacekeeping Brigade as they prepared for a NATO certification exercise conducted Sept. 15-18, 2015. The 190th Air Refueling Wing Civil Engineers spent two weeks conducting Humanitarian Assistance projects that included the construction of a warehouse for their EMEDs (Expeditionary Medical Support System) mobile hospital and refurbishment of hospital facilities used to train medical professionals from rural areas of Armenia. 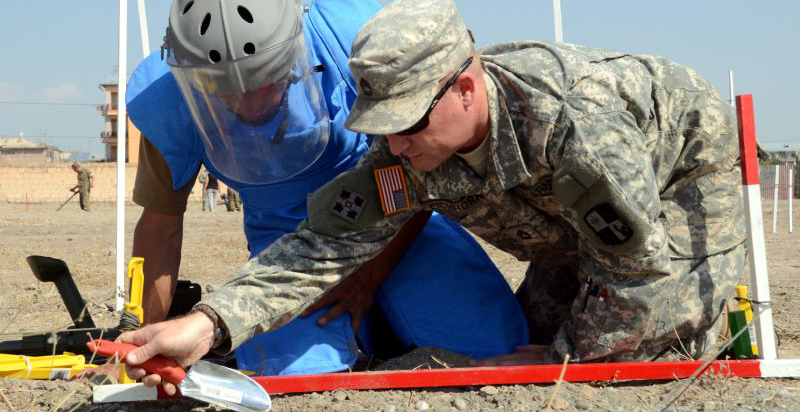 The 184th Intelligence Wing conducted a Chemical Biological Radiological Nuclear event with appropriate members of the Ministry of Defense and Peacekeeping Brigade. The team presented information on standard U.S. policies and procedures for CBRN defense operations. Armenian military leaders have come to Kansas to observe many aspects of the military and emergency management practices. They have observed the predeployment Soldier Readiness Program process in the Kansas Army National Guard. In preparation for future deployments, the visiting delegation observed Soldier Readiness Processing and station concepts and procedures for pre deployment screening. They also received briefings on personnel center organizational structure, mission, operations, unit readiness and status reporting procedures and actions required prior to deployment. EDUCATION: The education initiative has focused on agriculture and health-related engagements. The Kansas University Medical School and the Washburn School of Nursing identified areas of need in curriculum development, telemedicine, continuing education, and faculty and student exchanges that could be mutually beneficial for Kansas and Armenia health professionals. Kansas State University and its associate National Agricultural Biosecurity Center held a successful agri-biosecurity workshop in Armenia. This is a long-term effort to assist the country in developing its foreign animal disease response plan. Kansas State University is also exploring ways to assist Armenia’s agrarian university in its efforts to reform its agriculture programs. LAW ENFORCEMENT: Expanding on the efforts started in education, Kansas partnered with the Bureau of International Narcotics and Law Enforcement within the U.S. Embassy in Armenia to begin conducting law enforcement related events similar to the military events the Kansas National Guard has been conducting. Senior officials from the Kansas City, Overland Park, and Topeka Police Departments along with the Kansas Law Enforcement Training Center in Hutchison have traveled to Armenia to meet with their counterparts and senior government officials and formalize the relationship. The Kansas delegation has conducted several law enforcement related training events with Armenia. Areas of focus range from proper handcuffing procedures to community policing. 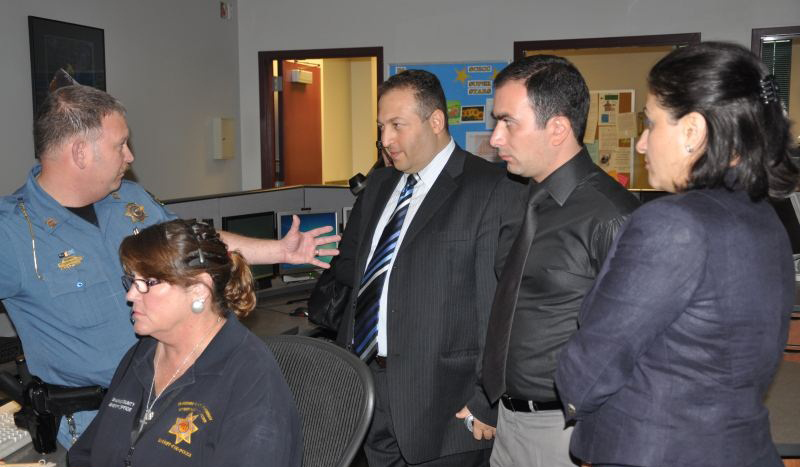 An Armenian delegation recently toured Shawnee County and Kansas City, Kan., 911 centers because they have decided to purchase a U.S.-based 911 system to implement in Armenia. EMERGENCY MANAGEMENT / DISASTER RESPONSE: Members of the Ministry of Emergency Services, the equivalent to the Kansas Division of Emergency Management, have come to the U.S. to observe disaster response exercises, Wolf Creek Nuclear Power Plant exercises, and tour the state’s Emergency Operations Center. 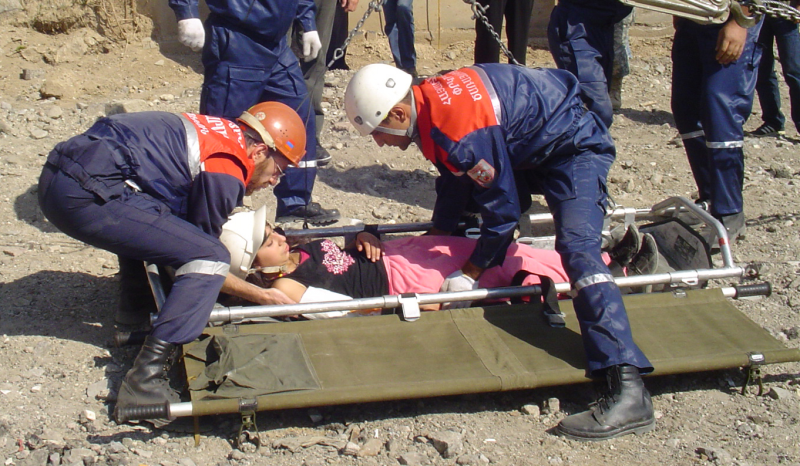 Staff from the Kansas Division of Emergency Management and Adjutant General’s Department have also traveled to Armenia to participate in earthquake/nuclear power disaster response exercises and provide insight into Kansas procedures. Future exchanges and visits are projected to continue averaging 15-20 engagements per year.